10 years is an incredible milestone, one I never expected to reach. It's more than a third of my life thus far, and in this past decade, I've met more incredible people than most will ever have the opportunity or fortune to be blessed with. 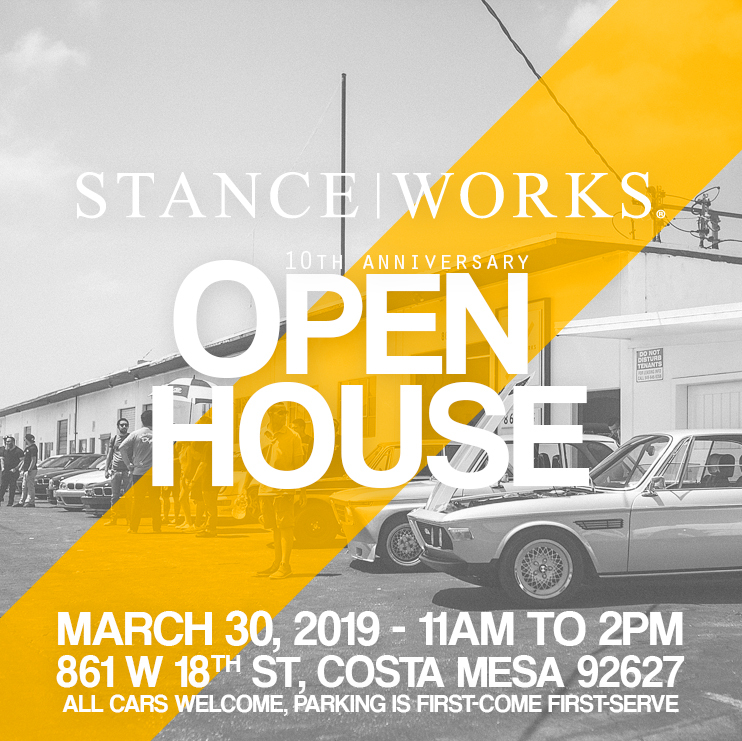 It was seven years ago that StanceWorks made the move to Southern California, cementing ourselves into the community with a brick-and-mortar homestead. Now, we're ready to open our doors once again and celebrate 10 successful and incredible years, and we're inviting you to join us. Come and join us for an afternoon of talking shop, admiring cars, and celebrating the community we've all built together. March 30th, 2019 - 11:00am to 2:00pm. 861 W 18th St, Costa Mesa, CA. Parking will, of course, be first come, first serve. We'll be offering free pizza for lunch, as well as free posters and other goodies. Save the date!